Facebook is taking self-referential (okay, let's call it what it is: unbridled narcissism) to new and spectacular heights with Timeline. That said, it's really excellent! How many ways can there be to say ME?! Here's a few. Feel free to chime in with your greatest hits! Here's looking at ME kid. I and love and ME. Someone like ME makes it hard to love, somebody else. I am the sunshine of my life. Even though we ain't got money, I'm so in love with ME honey.. 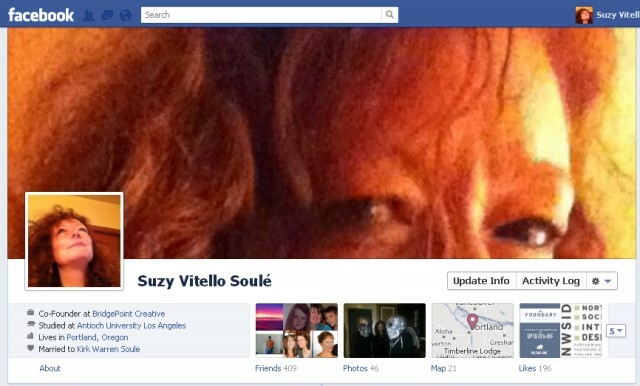 So, Facebookers, whatcha think of Timeline: Fun distraction, or the slippery slope of ME-VIL? I'm a freaking killjoy here. I switched over a couple of months ago. Within a few days, I was done with the distraction and went back to estalking my friends instead of myself. It is pretty cool though. I like being able to see old statuses without having to scroll through years of material. Oh, Lisa, you early adopter you! I, too, like the layout of the timeline better. It's a little pinterestish. More big pictures. Fun!